It began, as these things do, with a free trailer. Or, should I say, the offer of a free trailer. One of the professor’s colleagues decided to part ways with the [mostly unused] tent-trailer squatting on his property and sent out an email inviting people to adopt it. After hemming and hawing for a week or two, we drove over on a Sunday afternoon to take a look. It had a mauve and green ruffle along the interior and the corners of the ‘tent’ were held together with silver duct-tape. It had a fridge and a cooktop, though no one could say for certain if they actually worked. I didn’t dare open the little refrigerator for fear of finding a dead mouse inside it. Save one very cold, pillow-less, blanket-less night in a trailer three years ago, I haven’t ever spent the night out of doors. So it seemed slightly far-fetched to imagine I would fall in love with camping at this stage in my life. But we have these boys and isn’t that precisely what boys want to do? To be outside communing with nature, making fires and…. whatnot. Plus, of course, the trailer was free. So, with visions of extending our Oregon Coast vacation and leisurely stopping at various wooded campsites along the Pacific, we tentatively accepted custody of the Palomino Pinto. ‘What should we name the trailer,’ I asked the boys excitedly. They came up with a host of nonsensical suggestions, which I pretended not to hear. ‘What about Alice,’ I asked. ‘Alice!? That doesn’t make any sense,’ they scoffed. But I didn’t care. As the lone female in the house, I was determined to have something else with a girl’s name – even if it was a trailer. There were a couple of obstacles hovering between Alice and our ability to utilize her, not least of all the tiny matter of a hitch, and the fact that our unfashionable minivan did not have one. And there were her tires that had slumped into exhausted versions of their former selves. And. Approximately five minutes after imagining an idyllic extended coast holiday, the professor and I arrived at the same conclusion. ‘Maybe not!’ We’d [separately] envisioned some kind of automotive breakdown in the mountains, along with old-van-towing-a-trailer gas mileage, not to mention the fact it seemed overly optimistic to commit to two weeks of camping when we hadn’t even tried one. Night. So the Von Camper dream was deferred until we returned from the beach. And the professor managed to order a trailer hitch and cobble together enough bits of information to give him the sense that he knew what he was getting into. It arrived on a Monday night, the enormous box containing a black piece of metal. At roughly 9:00pm the professor ventured outside with a toolbox and lay down on the road underneath the van. ‘Uh oh,’ the neighbor remarked when she saw us, assuming trouble with the van, or a flat tire. Because why else would someone lie in the road on a Monday night? With ‘the hitch’ installed in relatively undramatic fashion, a plan formed in my mind. We could drive to Kananaskis on Tuesday. And camp, just for one night. We could test the trailer and the experience and it would cost us less than 24 hours of our lives. Of course, there was the tiny matter of electrical wiring and convincing the trailer to cooperate with the van’s turning signals, but given the seamless hitch installation, surely that wouldn’t take more than an hour. Or two? Tuesday morning arrived and the professor began his turning signal slash brake light operation. He ventured back in the house a while later and found me making granola, and pancake mix, and salmon and chicken and quinoa. ‘What are you doing,’ he asked suspiciously. He sighed the sigh of a man whose plans for the day had been taken hostage. There was a trip to Canadian Tire, and prolonged periods of standing by the blinking van wondering why the trailer refused to reciprocate. There were silences and looks-that-bordered-on-hostile-glares cast in my direction and despairing internet searches to locate a store that might carry the parts he needed, or some magical ‘here’s how you fix this mess’ solution from Google. 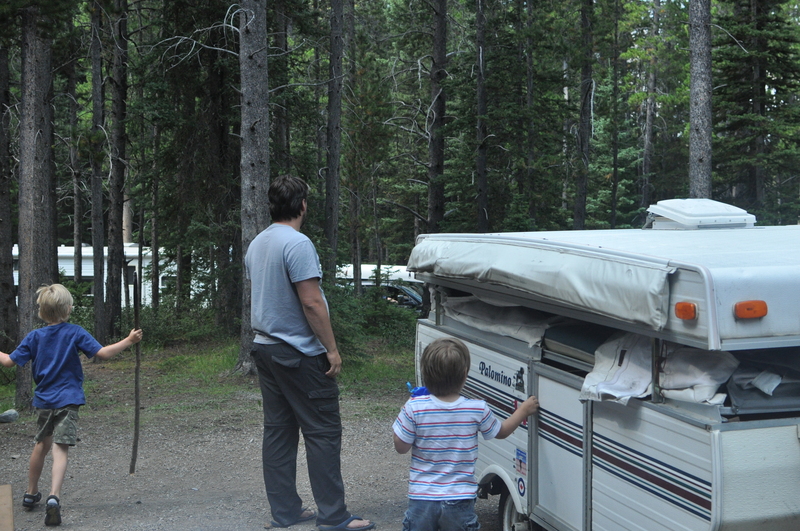 There was another trip to Canadian Tire and possibly another and possibly a fourth and it became very clear before the clock struck noon that the Johnsons were not going camping on Tuesday. Wednesday arrived and, as is the boys’ habit, they donned their backpacks before they were even dressed. It’s their unspoken way of reminding us that we’ve committed to an excursion and every minute that we’re staring at them with their backpack on their back is a minute they are not in the car on the way to the promised destination. Unfortunately theirs is not a peaceful, largely silent, protest. It’s also accompanied by repeated ‘when are we leaving,’ ‘are we leaving soon’, and ‘when are we going camping’ lamentations which only add fuel to the pressure-to-leave fire. It was close to 1pm when we finally managed to pull away, with Alice hopefully following behind. We are still planning on going for Canadian thanksgiving if that works for you. We need to hear about Alice. Hope to read part 2 soon! Twana you’re welcome to use Alice, but my experience tells me you’d greatly prefer the house 🙂 Look forward to seeing you! Kim, ummmmmm, I think it might have a heater but we certainly did not utilize it or figure out how to utilize it. Ma, coming soon!